The Internet has changed all of our lives, and in my opinion no single demographic has been impacted by this technology more than seniors. 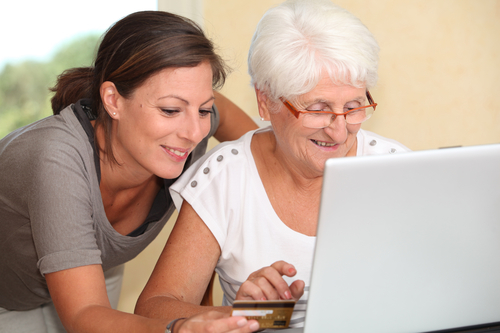 You might not automatically associate the Internet with the senior population but once they learn the basics of navigating the web they’re ready, able and more than willing to jump in and participate. And remember, they have the time and perhaps even the patience to discover the very best that the web has to offer! Seniors can often feel isolated and disconnected from their family and friends. It may be more difficult to get around, driving may no longer be feasible and families are often living far away. Email, Skype, and FaceTime can help mitigate the feelings of loneliness and depression, even making them feel more connected and intimate with loved ones. The Internet offers access to unlimited information and endless entertainment as well as different types of educational opportunities such as online classes. Even if the primary purpose is to simply pass the time in an otherwise unremarkable day, surfing the web provides mental stimulation and keeps a senior’s cognitive abilities fresh and focused. Shopping can be a stressful experience for seniors. Travelling to stores, navigating the aisles, sorting through the merchandise and maneuvering through the crowds is usually too much for most seniors to handle. The Internet makes it extremely convenient – and sometimes cheaper – to buy pretty much anything there is, so there is no need to do without or put off the shopping experience. The best way to get your senior up to speed on Internet use is for them to enroll in a group or private class that will teach them the basics and explain everything they need to get started. It may be slow going at first, and seniors are often a bit nervous about breaking the computer or making a mistake. This initial fear will quickly fade once they see that they can peck away freely and chat with their family, watch a movie or even read a book without any accidental mishaps. The Internet will expand their world just as they feel it is closing down just a bit.